At the Top of Squirrel Spur: Change is good, right? Every now and then it just becomes time to shake things up a little. It has been a very long winter here at Greenberry House and in Meadows of Dan. Although I do like having the chance to stay at home, my house began to feel very cramped by the end of February! And so did the shop. I've been thinking about making some changes, both for aesthetic and financial reasons. Spring, even if it isn't really here yet, seems to be the time to clear out the old and bring in the new. 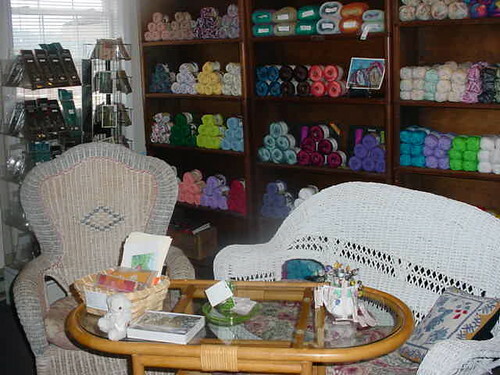 So it was out with all the books, which will return elsewhere someday soon, and in with lots of lovely new yarns and brightness! I've also expanded my line of knitting notions and needles and added Greener Shades Dyes to the mix, along with some lovely buttons that are just perfect for our beautiful local luxury yarns. 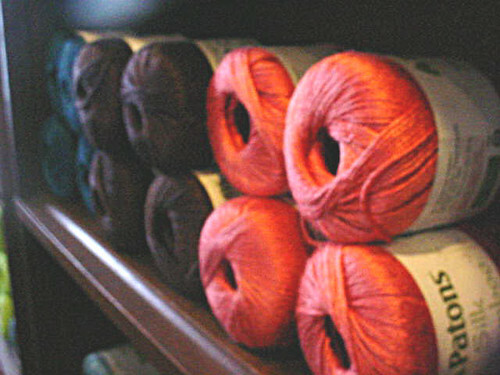 One of my favorite new yarns in the new yarn room is a lovely hand-dyed cotton created by a Virginia artisan. This is a unique yarn that really captured my attention when I saw it on Etsy. I'm making the Old Shale Shawl by Evelyn Clark with her Triple Green colorway for our Knitting in the Round KAL. There will be more pictures later, when I reach the point in the skein where the color starts changing. This is my first venture into commerical yarns, but I've had a demand from customers for yarns to make dish cloths and for prayer shawls. 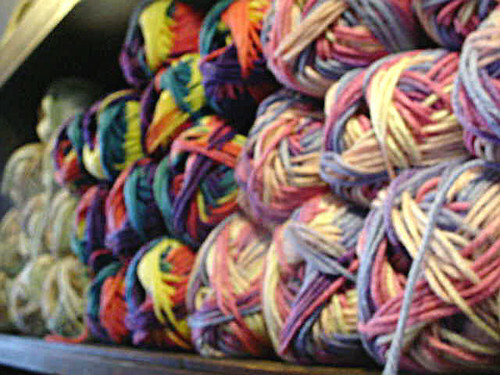 Our lovely local hand-dyed wools are wonderful for shawls, sweaters, scarves, hats and mittens, but sometimes you just need a work-horse yarn for certain projects. 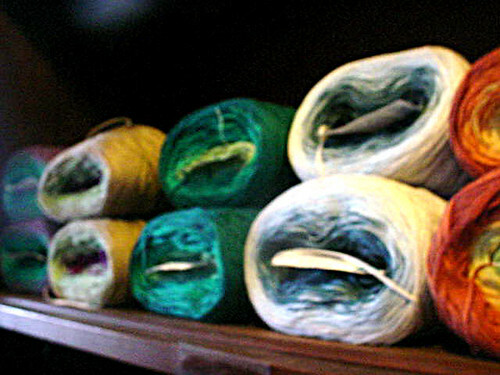 I chose two Canadian yarns for the shelves that seem to fit into the category of just plain good yarn. Patons Canadiana is an acrylic worsted that I stock in both solid and variegated colors, while Lily Sugar 'n Cream is a nice cotton worsted weight in soft solid and variegated colors. Lily is made from American cotton, which is nice. 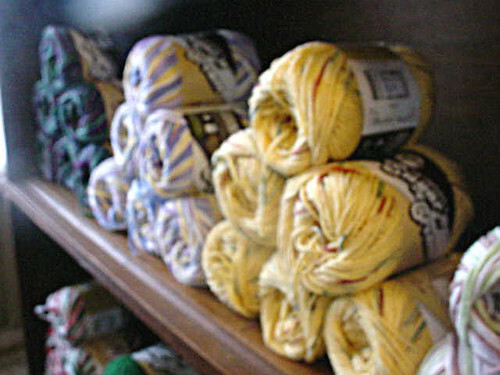 I'm also looking at some other cotton yarns that are a bit more upscale. Greenberry House is now open on Friday, Saturday and Sunday from 10 AM to 5 PM. We're seeing a drizzly, foggy day here in Meadows of Dan and snow showers are predicted for Monday, so winter isn't over yet. 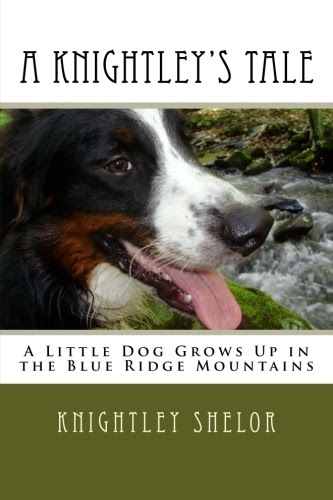 But soon the sun will be shining and it will be perfect weather for a visit to the Blue Ridge Parkway and Meadows of Dan!